The Legend of the Ford Torino! The Ford Torino is an automobile which was produced by the Ford Motor Company for the North American market between 1968 and 1976. It was a competitor in the intermediate market segement. The car was named after the city of Turin (Torino, in Italian), considered the Italian Detroit. The Torino was initially an upscale version of the intermediate sized Ford Fairlane, which Ford produced between 1962 and 1970. After 1968, the Fairlane name was retained for the base models with lower levels of trim than those models which wore the Torino name. During this time, the Torino was considered a subseries to the Fairlane. 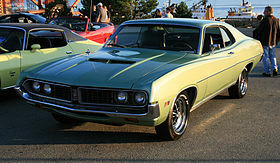 By 1970Torino had become the primary name for Ford’s intermediate, and the Fairlane was now a subseries of the Torino. In 1971 theFairlane name was dropped altogether and all Ford intermediates were called Torino. This name was one of several originally proposed for the Mustang while in development. The Torino was essentially a twin to the Mercury Montego line. Most Torinos were conventional cars, and generally the most popular models were the 4-door sedans and 2-door hardtops. However, Ford produced some high-performance versions of the Torino by fitting them with large powerful engines, such as the 428 cu in (7.0 L) and 429 cu in (7.0 L) “Cobra-Jet” engines. These cars are classified as muscle cars. Ford also chose the Torino as the base for its NASCAR entrants, and it has a successful racing heritage. In 1968 Ford Motor Company introduced its intermediate line with a new body and new styling. Along with the new body and styling came the a new subseries in the Fairlane line, the Torino. The Fairlane name continued to be used for lower level models, and the Torino was considered a sub-series to the Fairlane during this time. The 1968 Fairlane and Torino used the same wheelbases as its 1967 predecessor: 116 in (2,946 mm) on 2- and 4-door models, and 113 in (2,870 mm) for station wagon models. Styling was all new for the 1968 Fairlane/Torino, and it was drastically changed from the 1967 models. The new intermediate had grown in size and weight, and a new fastback model was added. The front fascia featured a full width recessed grille, with horizontal quad headlights placed at the outer edges. Horizontal dividing bars were featured in the grille depending on the model. Parking lights were placed at the outer edge of the front fenders and wrapped around the corner to also act as side marker lights (a new requirement in 1968). The body sides were smooth with one horizontal body crease running just below the beltline from front to back. The taillights were rectangular in shape and vertically situated in the rear panel above the rear bumper. Reverse lights were located in the middle of the taillights, and small side marker lights were located on the rear edge of the quarter panel. Fastback models, which Ford called “SportsRoof,” featured a slightly concaved rear taillight panel unique to that body style. The new SportsRoof body style featured a gently sloped long roof line that extended to the edge of the trunk lid. This new fastback body style gave the Fairlane and the Torino excellent aerodynamics that would later prove to be advantageous on the race track. Ford had 14 different models for its intermediate line for 1968. 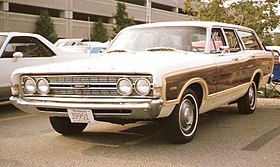 The base model was the “Fairlane”, which was available in a 2-door hardtop, a 4-door sedan, and a 4-door station wagon. Next was the mid level “Fairlane 500”, which was available as a 2-door hardtop, 2-door fastback called SportsRoof, convertible, and a 4-door sedan and station wagon. This was followed by the top level “Torino” series, which consisted of a 2-door hardtop, a 4-door sedan, and the Squire station wagon that featured wood grained applique. Finally, the “Torino GT”, the sporty version of the Fairlane 500 series, included a 2-door hardtop, SportsRoof, and a convertible. The Fairlane/Torino continued to be constructed with unit-construction like the 1967 models. The new car continued to use the same suspension as 1967 models, which was coil springs pivot mounted on an upper control arm and a strut stabilized lower control arms in front, with long semi-elliptical leaf springs on a solid axle in rear. A heavy-duty suspension option was available for V8 powered cars, and included extra-heavy-duty springs and shocks. Steering was recirculating ball system, with power steering optional. All cars came standard with four-wheel drum brakes, although front disc brakes and power assist were options. The interior on the Fairlane/Torino was all new for 1968. A new dashboard featured four equally sized round pods centred around the steering wheel. However, the pods did not contain a full set of gauges; rather an assortment of warning lights along with the speedometer and fuel gauge. The fuel gauge and temperature warning lights were in the first pod, a 120 mph (190 km/h) speedometer was located in the second pod from the left, alternator and oil pressure warning lights were in the third pod from the left and the fourth pod was blank. An optional tachometer was available, which would be located in the third pod, and an optional clock occupied the fourth pod. Ford offered many upholstery options, including a knitted vinyl option, called “comfortweave.” This unique option allowed the vinyl to “breathe” unlike conventional vinyl, offering more comfort in hot weather. Conforming to U.S. safety standards, there was much padding inside the Torino’s interior, which also featured shoulder belts for front outboard passengers on all cars built after December 31, 1967. Ford had quite a variety of engine options for its intermediate line. All models other than the Torino GT came standard with a 200 cu in (3.3 L) six-cylinder engine. Torino GT models came standard with a 302 cu in (4.9 L)-2V small block V8 and this was also the base V8 engine optional on other models. Other available engines included a 390 cu in (6.4 L)-2V FE engine, 390 cu in (6.4 L)-4V FE engine and a 427 cu in (7.0 L)-4V FE engine. About one month within the beginning of the 1968 model year production, a six week UAW strike against Ford occurred. This resulted in a cost cutting measure of making a 289 cu in (4.7 L)-2V small block V8 the base V8 engine and the standard engine on the Torino GT. Ford did not change any of its factory sales literature to reflect this change. While the 427 cu in (7.0 L)-4V FE engine was initially listed as an engine option for 1968 in factory literature, no Fairlanes or Torinos were actually produced with this engine during 1968. Introduced on April 1, 1968, the 428 cu in (7.0 L)-4V CJ (Cobra-Jet) FE enginebecame available as an engine option, but due to its mid-year introduction these engines are very rare. The 428-4V Cobra-Jet was by far the most potent engine available for 1968, but was said to be under-rated at 335 horsepower (250 kW). The cars equipped with the 428 Cobra Jets had emblems borrowed from the full-sized Fords (a red-and-chrome badge reading “428”) mounted on the fenders behind the parking lamps. All models came standard with a three-speed manual transmission, while the Cruise-O-Maticautomatic and four-speed manual transmissions were options. The Torino model featured full colour-keyed carpeting, additional exterior and interior trim, and Torino crests on the ‘C’ pillar. The Torino GT’s standard features included bucket seats and a console, special name plaques and exterior trim, GT markings on wheel covers, and courtesy lights on the inside door panels. The Torino GT was also available with a GT handling suspension package, which included extra-heavy-duty springs and shocks, and a heavy-duty front anti-sway bar. The Torinos equipped with the 428 CJ engines used stiffer springs and a larger front sway bar then other Torinos that had the heavy-duty suspension. Four-speed equipped cars had staggered rear shocks which help resist axle hop. GTs were available with a stripe option, which started as a ‘C’ shape at the edge of the front fender, and two body stripes extended the length of the car. As previously mentioned, station wagons came in three different models: “Fairlane”, “Fairlane 500”, and “Torino Squire.” All wagons came equipped with Ford’s “Magic Doorgate” two-way tailgate, and were available with an optional rear-facing third seat which increased the car’s carrying capacity from 6 to 8 people. Torino Squire models came standard with simulated woodgrain side panels, and had the more refined trim and upholstery of the Torino sedans. Unique station wagon options included a chrome roof rack and a power rear window. 1968 was a successful year for Torino with 172,083 units produced. Including Fairlane production, 371,787 cars were produced. The Torino was well received by the automotive press and a 1968 Torino GT convertible was selected as the 1968 Indianapolis 500 pace car. The 1969 Fairlane/Torino saw few cosmetic changes, but there were quite a few performance oriented changes. Ford performed the typical minor styling adjustments, but overall the 1969 models were similar to the 1968 models. The grille was revised slightly, and now had a more prominent centre dividing bar, while the taillights were more square in shape than the 1968 units. All models above the Fairlane, had an aluminium dividing bar that ran across the rear panel, between the taillights and inline with the reverse lights on SportsRoof models. The number of models produced by Ford increased for 1969, from 14 to 16. All carryover models were the same as 1968, with the two new models being the “Cobra” 2-door SportsRoof and 2-door hardtop. Most automotive literature list these models as “Torino Cobra”, with the Cobra being a sub-series to the Torino, although there is some debate about the true name of the vehicle. Most of Ford’s literature at the time only used the name “Cobra” without Torino or Fairlane attached. However, the Cobra has the same body code as a Fairlane 500, so some refer to these cars as the “Fairlane Cobra”. 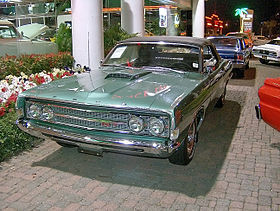 The car itself did not have any Fairlane or Torino nameplates on its exterior or interior, although 1969 NASCAR entrants were labeled “Torino Cobras.” For the purpose of this article, “Cobra” will be used, as Ford marketed the car as such in 1969 without Fairlane or Torino attached. The engine line-up was slightly revised for 1969. All models, except Torino GTs and Cobras, came standard with a new larger 250 cu in (4.1 L) I-6 engine. The larger displacement produced more power and torque than the 200 cu in (3.3 L) engine. Optional engines included the 302 cu in (4.9 L)-2V (standard on GTs), the new for 1969 351 cu in (5.8 L)-2V Windsor, 351-4V Windsor, 390 cu in (6.4 L)-4V, and the 428 cu in (7.0 L)-4V Cobra Jet (standard on Cobras). The 428 CJ was available with or without the Ram Air Induction package, however, those with Ram Air still carried the same advertised power rating. The 428 CJ without Ram Air, came with the following items: 80-ampere heavy-duty battery, 3.25:1 open differential, heavy-duty cooling package, 55-ampere alternator, chrome valve covers and dual exhaust. The Ram Air 428 CJ included all of the above, but had a 3.50:1 open differential, and the functional hood scoop. With Ram Air, “428 Cobra Jet” emblems were placed on each side of the hood scoop; without Ram Air, “428” emblems were placed on the front fender. The 428 Cobra Jet had a 735 cfm Holley four-barrel carburator. The 428 CJ was no longer the top engine choice; the ultimate engine option was the 428-4V Super Cobra Jet (SCJ). This engine was specifically designed for drag racing, and the option package was referred to as the “Drag Pack.” This engine option could be ordered with the Q-code 428-4V or the R-code ‘Ram Air’ equipped 428-4V. Included with 428 SCJ were cast pistons, a nodular controlled cast-iron crankshaft casting 1UA or 1UA B with an external weight on the snout behind the balancer, 427 (LeMans) capscrew connecting rods, an engine oil cooler, and either a 9 inches (230 mm) rear axle with 3.91:1 gears and a Traction-Lock limited slip or 4.30:1 gears with a Detroit Locker. The Detroit Locker and the oil cooler were industry exclusives to Ford. This package did not change Ford’s advertised power rating of 335 hp (250 kW). The Torino GT was relatively unchanged from 1968, and continued to come standard with a 302-2V engine. The grille received minor updates, including revised divider bars and the GT emblem moved to the lower left corner of the grille. The ‘C’ stripe was revised, and now ran in straight lines, rather than following the body line like in 1968. All 1969 Torino GT’s came equipped a non-functional fibreglass hood scoop that had turn signal indicators at the rear of the scoop (this was optional on non-Ram Air Cobras). This scoop became functional if the 428-4V with Ram Air induction was specified. The hood scoop could also be deleted from the GT for a credit. Although the Torino GT could be optioned to include all of the Cobra’s performance features, the GT was a more upscale vehicle and had the more deluxe Torino trim. Ford added one more special high-performance vehicle to its intermediate line-up, the Torino Talladega. See the NASCAR Inspired Torinos section for a detailed information on this model. Ford Torino production decreased for 1969, and a total of 129,054 units were produced. Including Fairlane production, 366,911 cars were produced, slightly down from the 1968 numbers. Torino GTs were the majority of Torinos produced, accounting for 81,822 units produced. Ford did not provide separate production number for the Cobra. For 1970, the Torino now became the primary model and the Fairlane was a sub-series of Torino. Ford moved away from emulating the boxy lines of the full-size Fords to a completely new body for the 1970 Torino/Fairlane line influenced by coke bottle styling. Just as tailfins were influenced by jet aircraft of the 1950s, stylists such as Ford stylist Bill Shenk who designed the 1970 Ford Torino were inspired by supersonic aircraft with narrow waists and bulging forward and rear fuselages needed to reach supersonic speeds. The new car featured a more prominent long hood short deck styling, and was longer lower and wider than the 1969 models. The roofline was lower, while all models now featured a much less formal roof line than previous years. The windshield rake was increased, and the SportsRoof models had an even flatter fastback roofline. The overall styling appeared much more aerodynamic than years previous, and featured a pointed front end. The grille covered the full width of the front fascia, and surrounded the quad headlights. The front fender line extended to front door, sloping downward and gradually disappearing in the quarter panel. Both front and rear bumpers were slim tight fitting chromed units, that carefully followed the body lines. The taillights were situated in the rear panel above the bumper, and were now long rectangular units with rounded outer edges. The model line-up for 1970 initially featured 13 models. The base model was the “Fairlane 500”, which was available in a 2-door hardtop, 4-door sedan, and 4-door wagon. Next was the mid-level “Torino”, which was available as a 2-door and 4-door hardtop, and a 4-door sedan and station wagon. The 4-door hardtop was a new body style for the 1970 model year. The “Torino Brougham” was the top trim level, and was available as a 2-door and 4-door hardtop, and a 4-door station wagon. The sporty “Torino GT” was available as a 2-door SportsRoof and convertible. Finally, the top performance model, the “Torino Cobra” was available as a 2-door SportsRoof only. To add to this extensive line-up, the Falcon name was adopted mid-year for a new entry-level intermediate. The Ford Falcon compact model continued for the first half of the 1970 model year, but was discontinued as it could not meet new federal standards that came into effect on January 1, 1970. At this time, the name was applied to the base trim level in the intermediate line. The 1970 1⁄2 Falcon was available as a 2-door and 4-door sedan, and 4-door station wagon. This was the lowest priced intermediate, and had even less standard features than the Fairlane 500. The Falcon was the only intermediate that featured a rubber floor instead of carpet, and was the only series that featured a pillared 2-door sedan. Also introduced mid-year was a Torino 2-door Sportsroof model, which was marketed as a low price alternative to the GT. With the above mid-year additions, the Ford intermediate line-up consisted of 17 separate models. The engine line-up received major changes, and only the 250 CID I-6, 302-2V and the 351W-2V were carried over from 1969. Most models continued to feature the 250 CID I-6 as the standard engine. Optional engines included the 302-2V (standard on GT and Brougham models), 351W-2V, the new 351 Cleveland available with a 2- or 4-barrel carburetor, and the new 429-4V 385 Series V8 (standard on the Cobra models). It should be noted that selecting the 351-2V on the option list could have resulted in the buyer receiving either the 351W-2V or the 351C-2V; both shared the same power rating and VIN code. The 429-4V was available in three different versions. The first was the 429 Thunder Jet, the standard engine for the Cobra, rated at 360 hp (270 kW). Next was the 429 CJ (Cobra Jet), rated at 370 hp (280 kW), which included a 2-bolt main block, hydraulic lifters, a 700 CFM Holley or 715 CFM Rochester Quadrajet carburetor, and was available with or without Ram Air. The top 429 option was the 429 SCJ (Super Cobra Jet), rated a 375 hp (280 kW), and was part of the “Drag Pack” option. Selecting the “Drag Pack” option turned a 429 CJ into a 429 SCJ. The drag pack required either the 3.91:1 or the 4.30:1 axle ratio, and included a 4-bolt main engine block, forged pistons, 780 CFM Holley carburetor, engine oil cooler, and a solid lifter cam. The “Detroit Locker” rear differential was included when the 4.30:1 axle was ordered while the “Traction-Lock” limited-slip differential was included with the 3.91:1 axle. The 429 SCJ was available with or without Ram Air induction, both versions sharing the same power ratings. Ram Air induction was also optional on the 351C-4V. The Ram Air option was revised to include a new “shaker hood” where the scoop was attached to the top of the air cleaner assembly, and protruded through a hole in the hood. The ‘shaker’ nickname came from the fact that it vibrated, or shook, when the engine was running. A 3-speed transmission was standard on all models except the Cobra. The Cruise-O-Matic and 4-speed transmissions remained options. Interiors on the Torino were all new for 1970. The dashboard featured a linear style speedometer centered on the driver, and a new “ribbon” style tachometer was an option for V8 models. A temperature gauge was the only available gauge; oil pressure and electrics were monitored with warning lights only. High back bucket seats were available for all 2-door models, as was an optional console; the GT model no longer had the former as standard features. All 2-door hardtop, SportsRoof and convertible models featured “DirectAire” ventilation systems as a standard feature, which eliminated the need for side vent windows. The 2-door sedan, 4-doors and station wagons still had vent windows, and the “DirectAire” system was an option for these models. The ignition switch was moved from the instrument panel to the steering column, in compliance with Federal regulations. The steering wheel and column-mounted shifter now locked when the key was removed. The Torino GT came standard with non-functional hood scoop molded into the hood, GT emblems (including the centre of the grille), dual colour-keyed sport mirrors, full width tail lights with a honeycomb effect (the centre portion was non-functional but reflective), black decklid appliques (SportsRoof only), and hub caps with wheel trim rings. Standard tires for the GT were E70-14 fibreglass belted tires, while convertibles wore F70-14s. New options for the Torino GT were a reflective laser stripe, which ran down the middle of the side of the Torino from the front fender to the door, and Hideaway headlamps. Motor Trend magazine tested a 1970 Torino GT SportsRoof with a 429 CJ, C-6 Automatic, and 3.50:1 gears, and obtained a 0 – 60 mph (97 km/h) time of 6.0 seconds, while the quarter mile took 14.4 seconds at 100.2 mph (161.3 km/h). The Torino Cobra remained the no-nonsense pure performance model, and had a lower level of trim than the Torino GT. The Cobra was only available as a SportsRoof model, and came standard with a 4-speed close ratio transmission, Hurst shifter, competition suspension, flat black hood and grille, 7-inch-wide wheels, F70-14 tires with raised white letters, twist style exposed hood latches, and “Cobra” emblems. New options included 15-inch (380 mm) Magnum 500 wheels with F60-15 tires and flat black “Sport Slats” for the rear window. Both of these options were also available on the Torino GT. Performance was excellent with the new 429 engine even though the Torino was heavier for 1970. Motor trend tested a 1970 Torino Cobra equipped with the Ram Air 370 horsepower (280 kW) 429 CJ, C-6 automatic and 3.50:1 rear axle, and it went 0 – 60 mph (97 km/h) in 6.0 seconds while taking 14.5 seconds at 100 mph (160 km/h) to go through the quarter mile. Motor Trend wrote “The weight obviously helped traction, as it was fairly easy to accelerate away from a standing start with only a modicum of wheelspin.” Motor Trend also tested a 1970 Cobra with a 429 SCJ, 4-speed and 3.91:1 gears, and resulted in a 5.8 second 0 – 60 mph (97 km/h) time, with a 13.99 second quarter mile at 101.0 mph (162.5 km/h). Super Stock and Drag Illustrated bested that time, in their test of a Torino Cobra equipped with the 375 hp 429 SCJ, C-6 automatic, and 3.91:1 rear gears. They were able to run the quarter mile in 13.63 seconds at 105.95 mph (170.51 km/h), however, this was after the carburetor had been modified (improved power valve, larger primary and secondary jets). Super Stock and Drag Illustrated then fitted a pair of slicks to the same Torino and ran a super quick 13.39 seconds at 106.96 mph (172.14 km/h). Station wagon models for 1970 were offered initially in three different levels: the Fairlane 500 wagon, the Torino wagon, and the Torino Squire wagon. Mid-year 1970, the Falcon wagon became the new base station wagon. The sheetmetal on the station wagons was not changed as drastically as 2-door and 4-door models. The majority of the sheetmetal behind the front doors was carried over from the 1968-69 body style. As a result the wagons appeared more upright and square than the sedans and coupes. The Torino Squire was the top level wagon and it featured simulated woodgrain sides, headlamp covers and a trim level similar to the Torino Brougham sedan. The Squire came standard with a 302-2V V8 engine, as well as power front disc brakes; other wagons had 4-wheel drums and the 250 CID I-6. All wagons still featured Ford’s “Magic Doorgate” two-way tailgate, while the power rear window, rear-facing third seat and roof rack remained options. Ford offered a trailering towing package for all Torinos that would allow Torino to have a Class II tow rating (3,500 lb (1,588 kg)). This package included heavy-duty suspension, heavy-duty battery and alternator, extra cooling package, and power front disc brakes. The 351 cu in (5.8 L) or 429 cu in (7.0 L) engine, power steering and the Cruise-O-Matic transmission were required options. For the 1971 model year, Ford limited changes to its intermediate line to minor revisions. The biggest change for 1971 was the decision to drop the Fairlane name from the intermediate line-up all together; the Falcon name would also not return for 1971. The Torino line-up consisted of 14 models. The base model was now the “Torino”, available as a 2-door hardtop, 4-door sedan and 4-door station wagon. Next was the mid-level “Torino 500”, available as a 2-door hardtop and SportsRoof, 4-door sedan and hardtop and a 4-dr station wagon. The top of the line Torino remained the “Torino Brougham”, available as a 2-door and 4-door hardtop, while the “Torino Squire” remained the station wagon equivalent to the Brougham. The “Torino GT” was offered as a 2-door SportsRoof and convertible, while the “Torino Cobra” was still only available as a 2-door SportsRoof. The styling was mostly unchanged for the 1971 models, save for minor revisions to trim and the grilles. The grilles on the 1971 Torinos now were divided by a vertical division in the centre of the grille for all models except the Cobra. The Cobra continued to use the same grille as used in 1970. A revised emblem was located on the vertical divider on the grille for all Torinos except the Cobra. The Torino 500, Brougham, Squire wagon and GT models had the Hideaway headlamp option available, which included a unique grille with a less prominent divider bar. The engine line-up remained almost identical to the 1970 model year, with most models featuring the 250 CID I-6 as standard. Broughams, Squires and GTs continued to have the 302-2V as standard, while the Cobra was downgraded to a 351-4V as its standard engine. All engines, other than the 429s, saw a slight drop in compression, which also resulted in a drop in power ratings. High insurance rates for muscle cars, and increasing concerns for emission controls were likely the reason for Ford’s changes to its engines. Other manufactures were following suit, including Torino’s main competitor Chevrolet’s Chevelle, which featured lower compression on all of its 1971 engines, while SS models had the 350 CID 2-barrel as its standard engine. Ram Air induction remained an option on the 351-4V, 429 CJ, and the 429 SCJ. The Torino Brougham continued to be Torino’s luxury oriented model. This model included Brougham ornamentation, additional trim, full wheel covers, additional sound proofing, and cloth trim. Hideaway headlamps were no longer standard, but remained an option for Brougham models. Motor Trend tested a 1971 Torino Brougham 4-door and stated “The [seat] cushioning and support was excellent. ..[and] the upholstery was magnificent.” The GT remained the sporty Torino and included dual colour keyed racing mirrors, GT identification, a non-functional hood scoop, hub caps and trim, rings, chrome trim on the foot pedals, full width taillights with the honeycomb effect, and E70-14 tires (F70-14 on convertibles). Production for 1971 was 326,463 units, slightly lower than 1970 Ford intermediate production. Only 1,613 Torino GT Convertibles and 3,054 Torino Cobras were produced for 1971. For 1972, the Torino was redesigned using many characteristics carried over from the previous generation. The 1972 Torino styling emphasized the “long hood short deck” look and had strong elements of coke bottle styling. The Torino line was also revised to be made up of basic models called “Torino” and more upscale models called “Gran Torinos.” The most radical change was a large eggcrate grille in an oval opening on Gran Torinos. Tom McCahill, stated “the gaping grille looks a little like it was patterned after Namu, the killer whale”, but also stated that the Torino had “kind of pleasing, no-nonsense styling.” Gran Torinos had chrome bezels surrounding the headlamps on each side of the large oval grille. Base Torinos had a full width argent eggcrate grille that surrounded the headlights. Base Torinos also used a unique hood and front bumper differentiating it from the Gran Torino models. 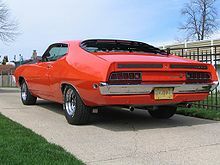 The Torino’s front fenders were flared around the wheel opening and the rear quarter panel had strong character line extending to the rear bumper. The windshield had a more rakish 60-degree angle, wile the A-pillars and roof were thinner. Even with this changes, structural integrity remained the same as 1971 models. The rear featured a full width bumper that incorporated thin rectangular tail lights into each bumper end. All Torinos had “DirectAire” ventilation as standard equipment resulting in vent windows vanishing from four-door and station wagon models. The Torino incorporated new safety features for 1972, including new flush mount door handles and side door guard rails. The number of models was reduced from 14 models in 1971 to 9 in 1972. The convertible was discontinued, and the 4-door hardtops and sedans were replaced with 4-door “pillared hardtops.” This was Ford’s term for 4-door sedans with frameless door glass. All other body styles remained, including the fastback, which Ford continued to dub “SportsRoof”. “Torino” remained the base series, but the mid-level Torino 500 was renamed “Gran Torino”. The Torino Brougham was reduced to an option package for the Gran Torino, and Torino GT became “Gran Torino Sport.” The Torino and Gran Torino were available as a 2-door hardtop and a 4-door sedan; the Gran Torino Sport was available as a 2-door hardtop and SportsRoof. The station wagon line-up consisted of three models: “Torino,” “Gran Torino,” and “Gran Torino Squire.” The Cobra model was discontinued as the Torino line was refocused toward luxury and de-emphasized performance. The biggest change for the Torino was the switch to body-on-frame construction from theunit-construction of the 1971 models. The new chassis was a perimeter design that was used to help give the Torino a quieter and more isolated ride. It featured an energy absorbing “S” shaped front end, torque boxes to isolate road shock, fourteen rubber body mounts and five solid cross members. The front suspension used an unequal length control arm design, with a computer selected coil spring mounted on the strut stabilized lower control arm, much like the fullsize Ford LTD. The rear used the “Stabul” four link suspension with a computer selected coil spring mounted on a solid axle. The new suspension and chassis had a wheel track at least 2 inches (51 mm) wider than the 1971 models. Motor Trend stated the “road isolation and vibrational dampening is superb” in its test of a 1972 Gran Torino Brougham 4-door. Ford offered two suspension options, the heavy-duty and competition suspension. The heavy-duty suspension included a larger front sway bar, and heavy-duty springs and shocks. Competition suspension, only available in two-door models, included the most heavy-duty springs and shocks, heavy duty rear upper control arms and bushings, a larger front sway bar, and the addition of a rear sway bar. This was the first year that a rear sway bar was offered in the Torino and was only available with competition and police suspension options. Front disc brakes became standard on all Torinos, which no other American intermediate (other than its sister car theMercury Montego) offered in 1972, however, power brakes remained an option. The only exceptions were that power brakes were standard on the Gran Torino Squire station wagons and a mandatory option for all 429 cu in (7.0 L) powered models. The power steering was revised to be integral in the steering box, rather than the external booster style used in previous years. All Torinos used 14-inch wheels, while 15-inch wheels were used for exclusively by police and taxi models. A significant change to Torino for 1972 was changing to separate wheelbases for 2-doors and 4-doors. Starting in 1968, GM had begun to use a shorter wheelbase for its 2-door intermediates, and a longer one for the 4-doors. This allowed for stylists to make fewer compromises when trying to turn a 2-door into a 4-door. Chrysler also followed suit in 1971, although its intermediate coupes and sedans didn’t even share body panels. The 1972 Torino used a 114-inch (2,896 mm) wheelbase for 2-doors and a 118-inch (2,997 mm) wheelbase for 4-doors, station wagons, and its sister vehicle the Ranchero. Like GM intermediates, the Torino 2-door and 4-door still shared many body parts. Overall, the size and weight for Torino had increased for 1972, following the longer, lower, wider trend. Gran Torino sedans saw a 5-inch (127 mm) length increase, while 2-doors only had a 1-inch (25 mm) increase in length. Interestingly, base Torino sedans were only 1-inch (25 mm) longer, and 2-doors were actually 3-inch (76 mm) shorter than 1971 models. Weight increased significantly for 4-door and station wagon models, while 2-doors had a slight increase in weight. The base engine was the 250 cu in (4.1 L) I-6 in all models except the Gran Torino Squire station wagon and the Gran Torino Sport which both had a 302-2V small-block V8 as standard. Available engines included the 302-2V, a 351-2V “Windsor” or “Cleveland”, a 351C-4V “Cobra Jet” (CJ), a 400-2V, and a 429-4V. The 400-2V was a new engine to the Torino line-up, and was part of the 335 series engine family like the 351 Cleveland. The 429-4V was not a high-performance engine like the Cobra Jets of previous years; instead, it was a high torque, low revving engine. Emissions, low lead and fuel economy requirements had become more strict for 1972. To meet these requirements, compression ratios on all Torino engines were dropped to at least 8.5:1, and all engines ran on regular gasoline. These engines generally produced less power than their predecessors in 1971, although this was exaggerated due to the switch to the new SAE net bhp ratings from the SAE gross figures used in 1971. As a result the figures are not directly comparable. All models came equipped with a three-speed manual transmission as a standard equipment. The Cruise-O-Matic remained optional, but was a mandatory option for the 351-2V, 400-2V and 429-4V. The 351-4V CJ required either the 4-speed or the Cruise-O-Matic as mandatory options. With the only performance engine being the 351-4V CJ, performance was good but not at the “super car” levels of the 429 Cobra Jet Torinos. The 351-4V CJ was new for 1972 and offered a number of performance enhancing features not offered on the 1970–71 351C-4V. It included a special intake manifold, modified camshaft, special valve springs and dampers, a 750 CFM Motorcraft Carburetor, 4-bolt main bearing caps and 2.5-inch (63.5 mm) dual exhaust. The 351 CJ was the only engine equipped with dual exhaust and it was the only engine that could be mated to the available four-speed transmission. The Ram Air induction system was available, and could be equipped on 351 CJ and 429 powered cars. Performance from the 1972 351 CJ was competitive with the 1970-71 Torinos with the high compression 351-4V. Car and Driver tested a 351 CJ, 4-speed Gran Torino Sport SportsRoof with 3.50:1 gears to have a 0 – 60 mph (97 km/h) time of 6.8 seconds. Car and Driver did not publish its quarter mile times, but Cars magazine tested a Gran Torino Sport SportsRoof with a 351 CJ, C-6 automatic, and 3.50 gears to run though the quarter mile in 15.40 seconds. Interiors were all new and featured a vastly improved instrument panel, that used ABS plastic for much of its construction. The standard instrument cluster featured five equally sized round pods and contained a speedometer, fuel gauge, and temperature gauge, along with various warning lights. The leftmost pod was a vent for the “DirectAire” ventilation system. A clock was optional with the standard instrument package. The “Instrumentation Group”, available on all V8 models, featured two large round pods centered on the steering wheel, containing the speedometer (with trip odometer) and a tachometer. A third equal sized pod on the left contained the DirectAire vent. The instrument cluster featured an ammeter, fuel gauge, temperature gauge, oil pressure gauge and clock in set of smaller stacked pods near the centre of the instrument panel. The seats were also new for 1972, the standard front bench seat had an integrated headrest for both outboard seating positions featuring, while the available high back buckets also featured integrated headrests. Ford continued to offer “comfort weave” vinyl seats as an option. These seats had the centre portion upholstered with a knitted vinyl material that allowed the upholstery to “breathe” unlike conventional vinyl. An optional 6-way power bench seat, replaced the 4-way seat offered in 1971. The Gran Torino Sport was offered as a 2-door hardtop and a 2-door SportsRoof. All Sport models featured an integrated hood scoop, which was only functional with the optional and rare Ram Air Induction system. Also included with this model was twin colour-keyed racing mirrors, moulded door panels unique to the Sport model, body-side and wheel lip moldings, and F70-14 tires (E70-14 on hardtop models). A revised full body length laser stripe remained an option. It replaced the chrome side molding, and was available in four colours to match the exterior paint. For the driving enthusiast, the “Rallye Equipment Group” included the Instrumentation Group, Competition Suspension, G70-14 tires with raised white letters, and a Hurst shifter for those equipped with the 4-speed. The Rallye Equipment Group was available the 351CJ-4V or the 429-4V exclusively. The Competition Suspension was highly regarded by Tom McCahill of Mechanix illustrated, as well as Motor Trend and Car and Driver as being less harsh than past Torino performance suspensions, while still offering excellent handling. Motor Trend described the suspension as “Unlike the super heavy-duty springs of years past, the folks at Ford have managed to produce superior ride control without harshness. It takes a ride in one [Torino] to truly appreciate it.” Torino’s new and improved chassis and suspension design can be attributed to this improvement. Torino wagons grew much larger in 1972. Length increased by 2-inch (51 mm) for Torino models, and 6-inch (152 mm) for Gran Torinos. Wheelbase was up by 4-inch (102 mm), width increased by 3-inch (76 mm), and weight increased significantly. The extra width allowed Torino station wagons to carry a 4×8′ sheet of plywood flat in the cargo area with the tailgate down. Station wagons had a rated capacity of 83.5 cu ft (2,364 L), nearing the capacity of some full-size wagons. An available rear-facing third seat was available, increasing the wagon’s capacity from 6 to 8 passengers. All station wagons had the 3-way “Magic Doorgate” featuring for the first time a tailgate that could be opened as a door with the rear window up. A heavy-duty frame was standard equipment for all wagons. The Squire models came standard with a luggage rack and simulated woodgrain panels that were slightly translucent, allowing some of the paint tint to show through. Torino wagons were often used to tow, but all Torino models could be equipped with one of two optional towing packages. A medium-duty trailer package for Class II towing allowed towing up to 3,500 lb (1,600 kg). This package included heavy-duty suspension, the extra-cooling package, trailer towing identification sticker and wiring harness. This option group required the 351-2V or larger engine. A heavy-duty Class III package included heavy-duty suspension, heavy-duty frame (standard on wagons), extra cooling package, heavy-duty battery and alternator, along with a 3.25:1 axle and trailer wiring. This package allowed the Torino to tow up to 6,000 lb (2,700 kg) and required the 400-2V or larger engine and G78-14 or larger tires. Both towing packages listed an automatic transmission, power steering and brakes as mandatory options. Overall, the 1972 Torino was a great success with the public and a total of 496,645 units were produced, making it the best-selling intermediate for 1972. This was the first time Ford had ever outsold the Chevrolet Chevelle since its 1964 introduction. The Torino on average was a safer, quieter, better handling and better stopping car then ever before. The automotive press responded well to the all new Torino, and it received many positive reviews. In addition, Consumer Guide selected the Torino as a “Best Buy” for 1972. The most obvious change for the 1973 model saw was a new front fascia, required to meet new federal regulations. The new regulation mandated that all cars manufactured after September 1, 1972 must be able to take a 5 mph (8.0 km/h) strike to the front without damaging safety related components such as headlamps and the fuel system. For 1973 only, rear bumpers had a 2.5 mph (4.0 km/h) requirement. The Torino’s front end featured totally new sheetmetal from the firewall forward, with a blunt, more squared-off fascia replacing the previous year’s pointed prow. The new large square 5 mph (8.0 km/h) energy absorbing bumper replaced the almost body-fitting chrome bumper used on the front of the 1972 Torino. The new larger bumpers caused all Torino models to increase in length by at least 1″, and weight also increased by at least 100 lb (45 kg) for all models. Separate grille designs were still maintained for Torino and Gran Torino models; they mimicked the ’72s in design. The Gran Torino now had a more rectangular grill with the parking lamps horizontally placed in the grille, but the quad headlights were still surrounded with a chrome bezel. The Torino models had a wider full width grill that surrounded the headlamps; however, the parking lamps were located on the outer edge of the fascia. The leading edge of the hood was now squared off to follow the fascia’s lines, and all models shared the same hood. The 1973 Torino maintained the rear bumper of the 1972 Torino, and incorporated minor changes to meet the 2.5 mph (4.0 km/h) mandate. Rear bumpers now featured an impact strip and bumper guards. The model line-up for 1973 increased to 11 from the 9 models in 1972. The new top level Torino was the “Gran Torino Brougham”, available as a 2-door hardtop and a 4-door sedan. All other models remained the same. Bench seats for 1973 now featured low backs with separate head rests to increase rear visibility. The high back bucket seats were still available on the two-door models. The hood release was moved to inside, for increased security. Radial tires were also a new option, and offered longer tread life and better road manners. The standard engine remained as the 250 CID I-6 for all models, except the station wagons and Sport which used the 302-2V. Engine options also remained the same, and all engines now had their compression ratio dropped to 8.0:1. Power for all engines was slightly lower than in 1972. The 351 CJ continued to be the only high-performance engine and only saw a 2 hp (1.5 kW) drop from 1972, although performance decreased again due to the weight increase. Police package Torinos had all the engine options of the civilian models while the “Interceptor” package featured a 460-4V new for 1973. All models featured larger 11-inch (279 mm) rear drum brakes for 1973 to help cope with the extra weight; 1972 models used 10-inch (254 mm) drums. The Gran Torino Sport now featured its own unique emblem, which it displayed in the grille and on the trunk lock cover. The laser strip was still an option but was revised to a slightly different shape, and ran higher along on the body side. The Sport no longer featured a hood scoop, and the Ram Air induction option was also gone. Other than the above changes, the Sport was unchanged from the 1972 model year, and continued to be offered as a 2-door hardtop and 2-door SportsRoof. In the Car and Driver magazine road test of a 1973 Gran Torino Sport, the suspension received high marks for comfort and handling. Car and Driver wrote that the Torino was as “..quiet as a Jaguar, smooth as a Continental, the Torino’s ride is exceptional…even with the competition suspension.” Their test of a SportsRoof equipped with the 351 CJ, C-6 automatic, and 3.25:1 gears, resulted in a 0 – 60 mph (97 km/h) time of 7.7 seconds while the quarter mile went by in 16.0 seconds at 88.1 mph (141.8 km/h). The 0-60 time was 0.9 seconds slower than the 1972 model Car and Driver tested a year before; however, this can partially be attributed to differences in gear ratio, transmission type, and a weight increase. The 1973 Sport had a test weight of 4,308 lb (1,954 kg), while the 1972 had a test weight of 3,966 lb (1,799 kg)(an almost 350 lb (160 kg)increase). Performance was certainly no longer at the “Super Car” level, but still was respectable. For comparison, in a Motor Trend test of a 1970 Torino 2-door equipped with a 351-4V, Cruise-O-Matic, and 3.00:1 gears, they recorded a 0 – 60 mph (97 km/h) time of 8.7 seconds, and a quarter mile time of 16.5 seconds at 86 mph (138 km/h). However, the high compression 1970 motor required premium fuel, while the low compression 1973 motor could run on regular. The Gran Torino Brougham featured the finest upholsteries in the Torino line-up, including nylon cloth fabrics and “leather like” vinyl. Standard equipment included a front bench seat with a fold down armrest, woodgrained trim on the instrument panel, deluxe steering wheel, electric clock, bright pedal pad trim, and a dual note horn. The Squire wagon was trimmed similarly to the Brougham. The comfortweave inserts were no longer offered in the Torino for 1973. 1973 was another successful year for the Torino, with 496,581 units being sold. The public continued to respond well to the Torino, even with the stiff competition from GM’s new for 1973 “Colonnade” intermediates. Torino in fact outsold its main competitor, the Chevrolet Chevelle, by over 168,000 units. The 1974 model year saw more revisions to the Torino line. Government safety regulations now required that the rear bumpers must also meet the 5 mph (8.0 km/h) standard, so all Torinos had the rear bumper and tail lamp panel redesigned. The new rear bumpers were much larger, square shaped, and sat lower on the body. No longer was there a roll pan located below the bumper as on the 1972–73 models. The tail lights were now shorter, more square, and wrapped around the corner, which eliminated the need for rear side marker lights. The fuel filler neck moved to a position above the bumper, rather than below as on 1972–73 models. It was now behind an access door in the centre of the tail light panel just below the trunk lock, rather than behind the licence plate. The front fascia for Gran Torinos was revised for 1974. The new grille was of similar shape to the 1973, but was slightly larger and divided into 8 equal sized vertical sections. A revised emblem was located on the left side of the grille. It had a much finer mesh pattern, and now had the parking lamp lenses mounted vertically behind the outer sections. The front bumper was revised to be slightly more pointed, and the bumper guards were moved more towards the centre of the bumper compared to 1973 models. The license plate bracket was relocated to the driver’s side of the bumper. Torino models carried on with the same front fascia as 1973; however, its front bumpers were revised similarly to the Gran Torinos and the license plate remained in the center. Gran Torino Broughams featured a full width red lens across the rear, but the centre portion was non-functional. Broughams and Squires had a stand-up hood ornament inplace of the emblem on the grille. Torino added several new options and features for 1974. Gran Torino 2-doors now were available with “opera windows”, a popular option during the mid-1970s, while Brougham models had these as a standard feature. All 2-door Torinos had fixed rear windows unlike the 1972–73 models. The Torino was becoming more luxury oriented and new luxury features were available. These included a leather-wrapped steering wheel, split bench seat, an electric sunroof, and speed control with steering wheel controls. Gran Torino hardtops and sedans had a new rear fender skirt option, to give the Torino a longer, lower look. The trim was revised on 1974 models; moldings now ran on the rocker panels instead of the lower doors. Brougham and Sport models had an extra chrome molding that ran on the lower fender edge between the front wheelwell and bumper; this gave the appearance of bumper-to-bumper chrome. Squires had no lower body moldings. All 1974 Torinos featured the seat belt-interlock system, as mandated by the U.S. government. This short-lived safety system would be removed after the 1974 model year. The competition suspension was no longer offered, and the only suspension option was a revised heavy-duty suspension package. This option was available on all Torinos except the Elite, and included a larger front sway bar and heavy-duty front and rear springs. Heavy-duty shocks and a rear sway bar were included in this package on 2-door and 4-door sedan models only; station wagons did not include these features. The Torino model line-up was the same as 1973, with two exceptions. The Gran Torino Sport no longer was available with the “Sportsroof” fastback roofline, and the new “Gran Torino Elite” was introduced. The Gran Torino Elite was developed by Ford to help respond to Chevrolet’s ever popular Monte Carlo. The Elite, was designed as an entry level “personal luxury” vehicle, for those who couldn’t afford a Thunderbird, and was in the same price range as the Monte Carlo. The Elite was described by Ford as ” A totally new 2-door hardtop. ..with Thunderbird-inspired styling, solid engineering and personal luxury. ..plus mid-size economy.” The Elite wasn’t totally new, as Ford described, but it did have a number of unique features. The Elite had unique front sheet metal, with styling that was indeed inspired by the Thunderbird. It had twin headlamps surrounded by chrome bezels and parking lamps on the outer edges of the pointed front fenders. Its grille was large and rectangular arching across the front. The quarter panels and doors were shared with the Mercury Montego and Mercury Cougar and did not have the sweeping body line like other Torinos. The tail light panel also featured larger tail lights that ran the full width of the car; the centre portion being non-functional. The Elite came standard with a 351-2V V8 engine, automatic transmission, and radial tires. It also featured standard luxury items such as a vinyl roof, opera windows, split bench seat, “Westminster” cloth upholstery, woodgrain trim, and complete instrumentation. Torinos were now even larger and heavier than ever before. All body styles were approximately 5″ longer due in part to the safety bumpers. With all Torinos gaining weight and inches, the 250 CID I-6 was no longer the base engine for any Torino. However, Chilton’s and Motor’s repair manuals list availability and data for 6-cylinder powered Torinos, even though original sales literature does not list this engine as being available. That said, it appears that some base model Torinos were built with the 250 CID 6-cylinder engine; in fact one of the 6-cylinder Torinos became the main car for the 2004 movie Starsky & Hutch. All Torinos and Gran Torinos now came with the 302-2V as the base engine, and the 3-speed manual remained the standard transmission. As in previous years, the larger V8 engine options required Cruise-O-Matic as a mandatory option. The 429-4V was replaced with the 460-4V which produced more power and torque, and was equipped with dual exhaust. Like the 429, the 460 was automatic transmission only. All other engines saw a slight increase in power levels compared to 1973. The 351 CJ remained the only performance engine (it produced more power than the 460-4V), and saw a 9 hp (6.7 kW) increase and a loss of 22 ft·lbf (30 N·m) or torque. It was the only engine available with the 4-speed transmission; however, this engine was limited to 2-door models only. The tide had turned against performance cars especially since the Oil Crisis in the fall of 1973. Accordingly, 1974 was the last year for the 351 CJ and four-speed transmission. The Gran Torino Sport was only a shadow of its former self for 1974. With the Sportsroof model discontinued, Sport models were often difficult to distinguish from Gran Torino 2-doors. To add insult to injury, the Sport was even available with optional opera windows (on vinyl-roofed cars) and fender skirts. The Sport continued to have its unique emblems displayed on the grille, the C-pillar, and the fuel filler door, plus “Sport” script was placed by the C-pillar emblem. When opera windows were ordered, the script was placed below the “Gran Torino” nameplate on the fenders, and the C-pillar emblem was deleted. The laser stripe was no longer available, but a lower body multi-coloured non-reflective stripe was an option. The Sport now used the same vinyl door panel of the other Gran Torinos. The instrument package became a standard feature, as were 78 series radial ply tires (70 series used in 1973). Bucket seats remained an option, but now were a low back design with separate head rests. At extra cost, Sport door panels and seats could be highlighted with coloured stripes. The optional “Magnum 500” wheel was revised with the formerly chromed wheel rim replaced by a polished trim ring and argent painted spokes. Performance was even more lackluster for 1974 models, with power down and weight up. The 1974 Sport had a shipping weight almost 400 lb (180 kg) heavier than a 1972 Sport. Torino had another successful year in 1974, and continued to be ever popular. Ford produced 426,086 units, including 96,604 Gran Torino Elites. For the 1975 model year, the Ford Torino received a number of minor improvements, but was for the most part unchanged. The model line-up received only one change; the Gran Torino Elite was no longer part of the Torino line-up. The Elite was now an independent model, and marketed simply as the Ford Elite. All Torinos featured solid state ignition systems for 1975, which improved starting performance and fuel economy, while reducing maintenance costs. Radial tires, another fuel saving feature, power steering and power brakes were all new standard features for all Torinos. 1975 Torinos featured a new steering wheel design and a new for that year option was a “Fuel Sentry” vacuum gauge. The 1975 model year saw almost no changes to the exterior styling. The only significant change was that Torino models now adopted the Gran Torino grille and front fascia. Torino’s weight continued to climb, even though the exterior dimensions were unchanged from 1974. The Federal Clean Air Act caused Ford to install catalytic converters for 1975 to help meet new emission standards. The converter significantly reduced the power output of the engines due to increased exhaust back pressure. In response, Ford changed the base engine on all Torinos to the 351-2V engine; along with this change, the Cruise-O-Matic transmission became standard. No manual transmissions were available. Power for all engines, except the 460, was significantly reduced compared to 1974, and with the weight increase, fuel economy and performance continued to decrease. The 400-2V and the 460-4V were the only engine options, as the 351-4V was no longer available. The 351 Cleveland was no longer produced after 1974. The new 351M (Modified) joined the line-up, although the 351W continued to be used alongside when the 351-2V was specified. The 351M used the 400’s tall deck block, and shared its connecting rods and intake manifold, so more parts were shared than between the 400 and 351C saving Ford production costs. The 351M and 351W had no appreciable power output difference; due to emissions standards, the 351M was not available in California. The Gran Torino Sport was still available, and remained virtually unchanged from the 1974 model. The Sport continued to remain almost indistinguishable from a conventional Gran Torino, and customers responded with a lack of interest. 1975 was by far the least popular year for this model; only 5,126 units were produced. Sales for Torino’s dropped off significantly from the 1974 model year. With the Elite now a separate model, Torino lost a large portion of its sales. Ford produced only 195,110 Torino’s for 1975. Even with the addition of the 123,372 Elites produced for 1975, total output was 318,482 which was still significantly lower than 1974. Sales decreases were likely due to the increased demand for smaller economical cars, while Ford’s new “sensibly” sized Granada likely also stole sales from Torino. The Ford Granada was classed as a compact by Ford, but actually had dimensions close to that of a late 1960s Ford Torino. The 1976 model year saw no major changes to the Torino line-up. The Gran Torino Sport was discontinued, and so the Torino consisted of 9 separate models; 2- and 4-door versions of the Torino, Gran Torino, and Gran Torino Brougham, along with three station wagon models. New options for the 1976 model year included a power trunk release and an automatic parking brake release. Gran Torino 2-doors could now be ordered with the center console when optional bucket seats were specified; previously the console was only available on Sport models. In addition, opera windows and landau roofs were now available options for all 2-door models. There were no styling changes made to Torino for 1976. Engine options remained the unchanged for 1976, however fuel economy was improved on all engines with revisions to the engine spark advance and the EGR valve operation. The 351-2V engines and the 400-2V had a power and torque increase, and the 460-4V had a power decrease. In an attempt to help improve fuel economy, the standard rear axle ratio for all models was now 2.75:1. 1975–1976 Gran Torinos were used in the popular Spelling-Goldberg Productions TV series Starsky and Hutch. The producers needed a flashy specialty car for the main characters to drive. Since Ford was the lease supplier for on-screen cars through their Studio-TV Car Loan Program, eventually it was decided by the producers that a bright red 1975 Gran Torino two-door would be the vehicle of choice for the pilot episode. To make the Torino less mundane, a large white vector stripe was added. Aluminum 5-slot mag wheels and larger rear tires replaced the stock wheels and tires, and air shocks were added to give the car an aggressive rake. The television show became quite popular with the public, and much of that popularity was centered on the star Torino. Ford couldn’t help but take notice to the public’s interest in the “Starsky and Hutch” Torino, and decided to introduce a replica version of the TV car. Ford built 1,000 replicas of the “Starsky and Hutch” car in the spring of 1976. Production of the replicas began in March 1976, and all were produced in Ford’s Chicago manufacturing plant. This limited production package was essentially a special paint option, but required the deluxe bumper group and dual color-keyed sport mirrors as mandatory options. The TV car’s slotted mag wheels were not offered by Ford, and the only aggressive wheel option was the “Magnum 500” wheel. They were not a mandatory option though, and these cars came equipped with wheel covers as a standard feature. 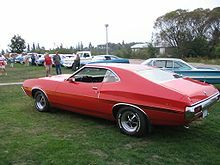 When producing the replicas, Ford painted the entire car white, then masked off the stripe and painted the rest of the car the shade of bright red (code 2B) used on the 1972–75 models (and subsequently the TV cars); this color had been discontinued for all other Torino models for 1976 in favor of a different shade of red. The factory replicas were close to the TV show car, but had minor differences in the stripe, and did not have the aggressive rake of the TV car. Many replica owners installed slotted mag wheels, and air shocks after purchase to give the car a more authentic look. The “Starsky and Hutch” replica was available with all Torino engines. Seat colors were limited to black or white and were available with all seating trims and options. One of the factory replicas was leased to Spelling-Goldberg as a backup for the original Torinos that were created for the show. Production total for Torino in 1976 was 193,096 units, slightly lower than 1975. This would be the final year for the Ford Torino. The Torino chassis continued to live on under the Ford LTD II, Ford Thunderbird, the Mercury Cougar and the Ford Ranchero for 1977 to 1979 model years. The fastback roofline of the 1968-69 Ford Torinos provided a wind-cheating design that dominated NASCAR superspeedway racing. In 1969 Dodge responded with the Dodge Charger 500. This car was built with specific modifications to improve the aerodynamics of the car on the NASCAR track. In turn Ford added a special high-performance vehicle to its intermediate line-up, the Torino Talladega. This limited edition car was made specifically with NASCAR racing in mind and all of its modifications were to improve the aerodynamics of the Torino. The Torino Talladega was equipped with unique front fascia that extended the length of the car by approximately 5 inches (127 mm). This front-end extension allowed Ford engineers to taper the front-end to reduce drag. The grille, which was normally recessed was made to be flush fitting, and the smoother rear bumper was reworked to fit the front. The rocker panels were rolled, which allow NASCAR teams to lower their race Talladegas by 5 inches (127 mm) legally. The Talladega came only in the SportsRoof body style and in three colours: Wimbledon White, Royal Maroon, and Presidential blue. All had a flat black hood and a unique beltline pin stripe. The Talladega came standard with a 428 CJ (non-Ram Air), C-6 Cruise-O-Matic, staggered rear shocks (normally reserved for 4-speed cars) and 3.25:1 open differential. Talladegas were equipped with a cloth and vinyl bench seat, and interestingly enough used the Fairlane 500 body code like the 1969 Cobra. These cars could not be ordered with additional options, and only 743 Talladega’s were produced. The Talladega further improved Ford’s success rate on the NASCAR track. Dodge and Plymouth responded with the even more radical 1969 Dodge Charger Daytona and the 1970 Plymouth Superbird which used pointed nose cones and “goalpost” tail wings. Meanwhile for those racing teams using Fords in 1970, some kept their 1969 Torinos when the new curvaceous 1970 models proved to be slower on the NASCAR track due to its less aerodynamic design. Ford planned to introduce another limited edition Torino to once again dominate at NASCAR. 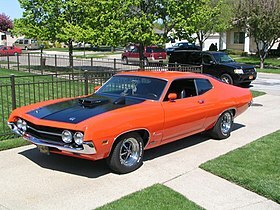 The result was the 1970 Ford Torino King Cobra. Like the Talladega, the King Cobra was modified with aerodynamics specifically in mind and looked very different from a typical 1970 Torino. It had a sloped front end with dual headlamps located in sugar scoop shaped cut-outs on the front fenders, similar in appearance to the Datsun 240Z. The King Cobra’s grille was a large opening below the front bumper, much like the bottom breather design now used in some in modern cars. Parking lamps were located between the headlamps, molded into the front fascia. The hoods had a blacked-out center portion, and a side stripe similar to 1968-69 Torino GTs ran from the front fender to quarter panel. Ford planned to offer covers for the headlight cutouts to NASCAR teams to improve aerodynamics even further. In actuality it is said the front end created too much down force. In addition to no rear down force creation this caused the car to become very loose in turns as per Musclecar Review. Due to NASCAR changing the homologation rules which increased the minimum number of cars produced for the public from 500 to 3,000 for a vehicle to qualify at NASCAR, the King Cobra project was abandoned by Ford. It never saw a NASCAR track or a showroom and only three prototype cars were produced. One was equipped with the Boss 429 engine, only offered otherwise in the Boss 429 Mustang, one had the 429 SCJ, and one had a 429 CJ. The Torino King Cobra with the Boss 429 has been listed on eBay as of 3 May 2014, with a “buy-it-now” price of $599,999. The 1970–71 Torino Cobras, the 1969 Torino Talladega, the 1970 King Cobra, the 1968–1971 Torino GT convertibles, and the 1969 Cobras are collectable muscle cars today. The 1972 body style has received notable recent exposure with the release of the 2008 film Gran Torino (featuring a 1972 Gran Torino Sport and Clint Eastwood) and the 2009 film Fast & Furious. 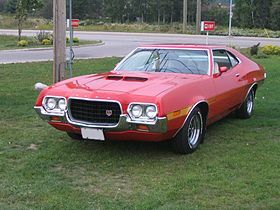 The 1974–76 body style was popularized due to the 1970s television series Starsky and Hutch, and revived with the release of the 2004 film Starsky & Hutch. As a result the value of the 1974–76 Torinos has risen; still they are not the most valuable of the Torino body styles. However, the limited-edition factory replica Torino will likely be a valuable investment due to the series having a longtime cult following. The lack of popularity and the low numbers of Torinos in existence today is likely due to the Torino’s durability issues that caused low survivability. Torinos had serious problems with chassis and body corrosion as well as having a less-than-perfect reliability record. In areas where severe winters exposed these cars to road salt, Torinos were reported to have major rust problems within the first 5 years of ownership. To further worsen the corrosion problems, 1969–1973 Torinos were reported to have severe paint-peeling problems. As a result, Torinos had the lowest resale value of any of the American intermediate cars in the 1970s used-car market.